It’s been nearly two years, but I can still feel the pain, anguish, and trauma brought about by Rianna’s sickness that almost cost her life. 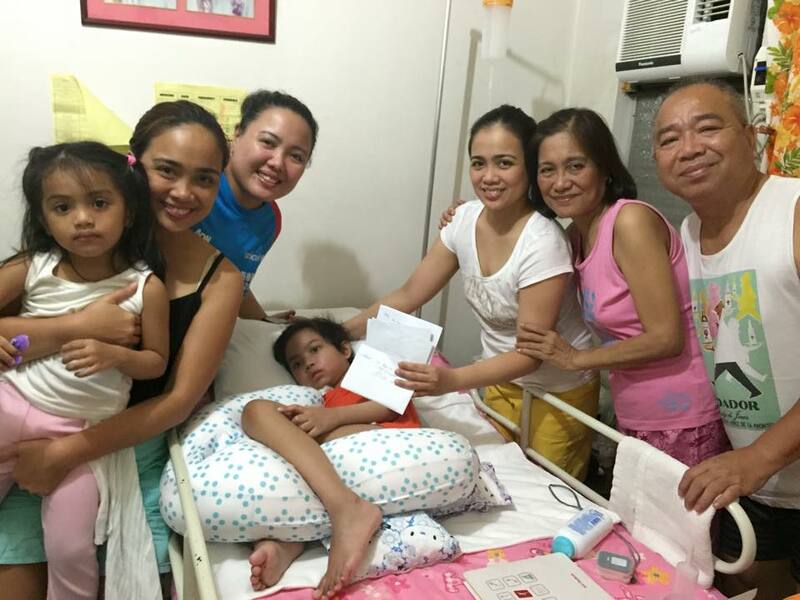 Rianna is my nine-year-old niece who suffered from mycoplasma encephalitis. She was hospitalized last October 17, 2015. Encephalitis is an acute inflammation of the brain. The majority of cases are caused by either a viral infection or the immune system mistakenly attacking brain tissue. It is a rare disease that occurs in approximately 0.5 per 100,000 individuals – most commonly in children, the elderly, and people with weak immune systems. So just imagine our shock when we found out about her condition. Of all kids, why Rianna, a very charming, talented, sweet girl who’s well-loved by many? Why this has to happen to our family? I cannot even start telling you what my family and I had been through without getting too emotional. Aside from the emotional pain, her 10-month hospital confinement cost our family almost PhP 13 million (hospital bills and daily expenses combined). Where in the world are we going to get that huge sum of money? Well, thanks to some charitable institutions, government offices, fundraising events/campaigns initiated by our good friends, and monetary donations from our families, relatives, and good friends we were able to manage that huge financial debt. While Rianna is at home now recovering, we are still struggling to make ends meet as we still need to support her monthly medications and vitamins, rehabilitation, physical therapy, and check-ups, making sure she won’t have infections, colds, coughs, or fevers, or else she’ll have seizures and we’d go back to square one. It was hard. What more if we don’t have means to support her. But despite everything, we are still thankful that God gave this second life to Rianna and to our family. I also think this is a blessing in disguise. Not many people are given a second shot at life, but we have been given this one, isn’t this enough to be thankful for? While it cost us a lot financially, it kept our family bonded and united, and we’ve become more open and closer unlike before. Up to now, I still get paranoid whenever I receive texts from my sister informing me that Rianna has a slight fever or that she’s having minor seizures, most especially if I don’t receive any response from them if I inquire about Rianna. I don’t want to go through seeing her fighting for her life again, the anxious feeling of waiting for her test results hoping she doesn’t have any infection, the look on the doctors’ faces whenever they try to explain her delicate and complicated condition, sleeping on the cold floors and benches outside the ICU, spending weekends, after office hours, and special occasions at the hospital, sleepless nights, endless crying, receiving frantic phone calls and texts, looking (to almost begging) for funds to pay for our hospital bills EVER AGAIN. And if there is one important thing I’ve learned from this experience apart from gaining strength is that you have to hold on and keep the faith and believe that everything happens for a reason. Two years have gone by so fast. I cannot imagine we’ve been through all that! But with steadfast prayers and support from our family and community, our family survived it all and God has always provided for our needs and Rianna’s even before we ask them. It wasn’t easy to be strong. I still break down, cry at night or whenever we talk about what happened during our family dinners or casual talks, but life must go on. We just have to remain positive because I know that things will get better soon. We also have to stay strong for my sister, Rianna’s mother, who had to take care of her solely 24/7 and endure the pain of seeing her only daughter suffering every single day. There should be no room for negativity. I also learned to manage my expectations. During our hard times, I learned not to expect people to understand our plight because those people whom I thought cared didn’t care at all and those whom I didn’t expect to care, simply cared. I learned not just to manage my expectations, but also not to expect anything at all. People will help if they want to, you don’t have to beg or ask them. Be grateful. Help came to us in all forms so we learned to appreciate them and be grateful because who knows that’s the only thing they’ve got? A friend who has a sick child extended a helping hand because she said she knows what we are going through – she understands. Some people are also bearing their own crosses we know nothing about. The least we can do is to try to be nice and understanding and accept whatever help they can give. Learn to forgive. It’s easy to blame someone for what happened to Rianna just for the heck of blaming – her parents, doctors, or somebody else – but at the end of the day, no one wanted this to happen. No one wanted to see her suffer. I cannot even wish this to my worst enemy. They say, there will always be people in our lives who will treat us wrong, but be sure to thank them for it made you a stronger and better person than before. I learned to forgive myself for my shortcomings and other people as well for theirs. Nobody’s perfect anyway. And lastly, I learned to treasure my family, friends, and relatives who’ve been there with us during our difficult times. “Family is the best thing you could ever wish for. They are there for you during the ups and downs and love you no matter what.” While hard times will always reveal your true friends. That being said, up to now I’m still struggling to share this experience without being too emotional. I had to edit this post several times and still haven’t shared the full details of our experience. I promise on my future posts, I will do my best to share everything. “The pain that you’ve been feeling can’t compare to the joy that’s coming” (Romans 8:18). I say, Amen to that! Before I end, I’d like to thank one amazing person, Ipuna Black for introducing me to this blog collaboration and for inspiring me to write everyday and to Jane Love for the encouragement and the push. This is actually their second collab. I’m really happy, excited, and so grateful to become part of this collab. Hopefully one day, I do get to meet all of the writers in person and in one time zone. You know what I mean guys! Thank you Nicolle. We are hoping for the best and staying positive. Take care too and hope to meet you soon. I know Ipuna. I know you understand. Honestly, I was inspired by your earlier post about Jy and I admired how you were able to write about it. When Rianna got sick, everything just stopped. It is only now that we are trying to start living normally. Much has changed, but as they say, everything happens for a reason. I’m just glad somewhere along those dark times, we meet people along the way who understands and knows what we are going through and you are one of them. Thank you for the support. Hope to meet you soon. Yes! I couldn’t write about Jy like really write about him until almost 2 years later! It’s too close to the heart when you are still living it. Jy had a LOT of therapy after, so my mind was there. I just pray for continued recovery for Rianna. I’m grateful to God for what he has done and has been doing for you and your family. And yes! There’s a joy coming so massive that y’all will be amazed. I have faith that Rianna will get healed totally very soon. Just keep holding on to God’s Word and confessing it for yourself. Also, yes. We’ll all definitely meet one day for sure. Or at you, Ipuna and I will sit down and chat over some tea. 😀 And thank you for your kind words. Thank you Jane! I am positive that joy is coming soon. God is good! And yes, let’s sit down and chat over tea (and coffee!) haha. Hope to meet you soon! Thank you Sonyo! Yes, I’m staying positive that things will get better soon. This made me really emotional. It must not be easy for you all but hold on the strength. Best wishes to Rianna and you. One day she’ll be cured, have faith in God and his plans. What an amazing post and it is pointing out a real life event. Thanks for sharing and I can relate to few points, talking of managing expectations, practicing gratitude and forgiving, it takes an impeccable strength to do those things but Nature has endowed us with the innate strength to be courageous and do them when the need be. Thanks for pointing out those points for others to know, keep up the good work and stay blessed. You are an incredibly strong lady. You didn’t give up then and I know you win give up anytime ! Ri is a pretty girl. And she is just as brave as her aunt. I know how bad financial debts can get, But I’m happy you had the support of your loved ones. The bit about how you have to manage expectations struck a chord with me. Yes, you are absolutely right about how people react; some step up when you don’t expect it, others don’t when you do, and it’s hard to understand the reasons why. But if you try to expect nothing at all, you can be pleasantly surprised on the one hand, and be far less annoyed on the other (if you get annoyed at all, being so busy with the crisis at hand that you may not even think about these others who didn’t step up when they almost certainly should’ve). Yes, trying times do bring out the best and worst in people. I think they brought out the best in your family, and I’m very, very glad you and yours were able to raise that immense sum of money to care for Rianna. But as you say, money is not the point. At any rate, I could tell how painful it was, and I sympathize greatly with you and your family. I’m thankful you made it through, and I hope Rianna will continue to gain strength, health, and enjoy the love of her family and friends for a long time to come. Thank you for taking time to read my post. Yes, it was incredibly painful and traumatic, but thank God we are recovering from it, she is recovering from it. Although it is slow, we are positive that we will get to her full recovery. Thanks again for the kind words. It means a lot. You’re most welcome, Mylene. I’m just sorry I didn’t find time to read it sooner. Sometimes the best recoveries are slow processes, but I know it’s really frustrating to watch. The only thing you can do is what you’re doing; think good thoughts, pray when needed (or wanted), be kind and good and loving to Rianna and the rest of your family, and keep being the kind-hearted person you are. I know it doesn’t feel like much, some days, to do those things. But it’s all you can do, and I think it’s greatly appreciated (whether anyone says so or not — I know families sometimes aren’t great at expressing their appreciation).